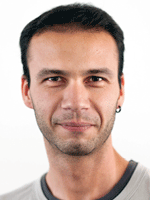 Ioannis Papachristou has been a doctoral fellow of Topoi`s research group (D-II-2) Place, Space and Motion. His doctoral thesis was on Philoponus’ accounts of place, void and motion (Thesis: “Philoponus on τόπος. Redefining Place in Late Antiquity”. He has been a Visiting Student Research Collaborator at Princeton University, USA. He studied philosophy at the Department of Philosophy, University of Patras, Greece (Thesis: “The genesis of time in Plotinus’ treatise III.7 (45), On eternity and time“) and he was granted a Master’s degree in Philosophy and History of Science from the Department of Methodology, History and Theory of Sciences, University of Athens, Greece (Thesis: “Noesis and dianoia: two different ways of thinking in Plotinus”). He participated to the Summer Course on “Philosophy and Science in the Greek-Roman world”, organized by the Center for Hellenic Traditions-Central European University, Budapest. He studied Greek paleography at the Historical and Paleographical Archive, Athens, Greece (MIET) and he participated in the Summer School “Griechische Paläographie, Handschriftenkunde und Editionswissenschaft” held by the “Zentrum Grundlagenforschung Alte Welt”, Berlin-Brandenburgische Akademie der Wissenschaften (BBAW).